Content: New construction of a 265 unit, 6-story multi-family community in the North Point neighborhood of Cambridge is one mile from downtown Boston. Degen & Degen’s design pays homage to the site’s historical roots as a glass factory on the Glassworks Avenue. 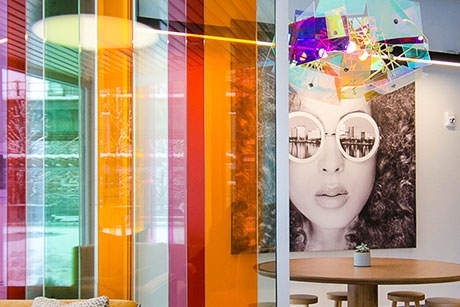 The interiors are designed with thoughtful attention to light with stained glass walls that provoke colorful light play and an interactive LiteBrite wall featured in the fully teched-out residence lounge. 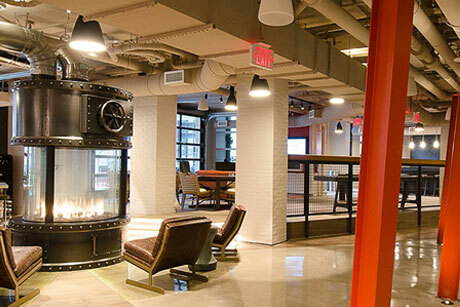 Reclaimed historical Green Line structural steel columns that frame the elevators add a splash of steampunk flair. Other amenities include a luxury pet spa, bike workshop & DIY lounge, state-of-the-art fitness and landscaped elevated courtyards that run along the old Green Line transit rail. The curved language of the main amenity space provide relief to the angular architecture of the shell and core designed by Ku Sung Woo architects. Like a round peg in a square hole, this project combined thoughtful integration of interior design with architecture creating a dynamic living space that stands out from the crowd. Content: Located in Seattle, original neighborhood, Pioneer Square this new hotel stands as an upscale urban hotel with a boutique design. The 282 all-suite property is unmatched in its panoramic views and proximity to Seattle’s most iconic attractions and experiences, such as the King Street Train Station and Pike Place Market, and resides just around the corner from the bustling Stadium District. Curated for a neighborhood experience, the design remembers the Golden Age of travel when romantics journeyed for the adventure and cache of exploring new places and new cultures. With design cues taken from this era, the interior is modern and chic, capturing the spirit of Seattle and offering guests a glimpse into what makes the city unique with an attitude of speed, style, and grace. 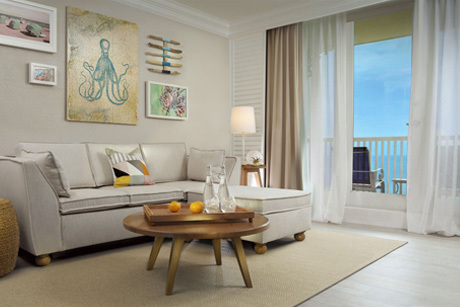 Custom suites crafted to embody the various moods and facets of the city are furnished with pieces from local artists, including murals and blown glass. 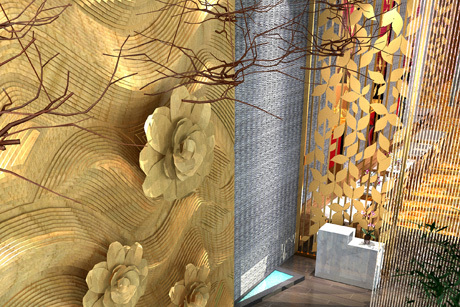 This, accompanied by references to famous cultural and natural icons, give the visitor a sense of place, while finishes of warm wood, polished stone, champagne shine metals, and classic patterns create an atmosphere of couture detailing and elegance. Content: Kona Kai Resort & Spa is an oasis nestled in the liveliness of San Diego, California. New construction of 2 new satellite buildings and outdoor pool within the footprint of the existing marina-side resort - one comprised of (8) Luxury Suites, and the other of (33) Junior Suites. 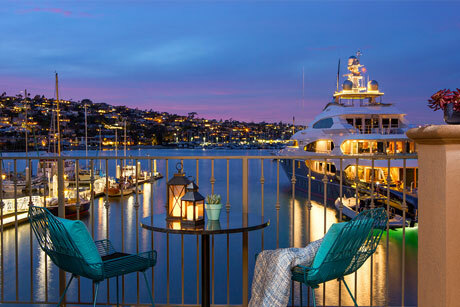 The luxury Suites feature double sided fireplaces offering peek-a-boos to the Marina and spacious bathrooms complete with double vanities, soaking tubs and mosaic tiled showers. 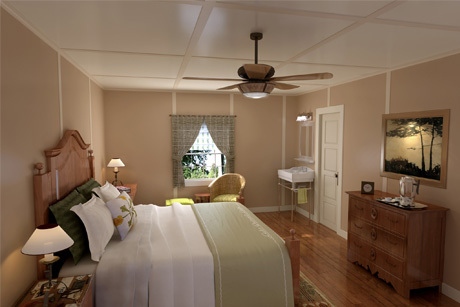 The Junior Suites feature a modern bohemian “So-Cal” eclectic take on the traditional guestroom design. Showcasing vibrant local artists and instagrammable moments at every turn. Content: The River Terrace Inn, settled along the Napa River in Napa, California, has expanded, introducing fresh new features as of Fall 2017. Added were, 2 new floors of guestroom suites and a renovation of existing public spaces, including a new 1,500 SF Ballroom. 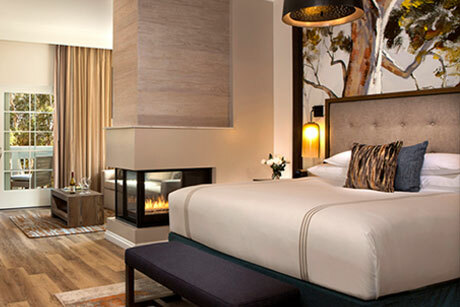 With an immersive experience and its Napa Valley roots in mind, the vision of this hotel's expansion comes to life in all aspects of the Suites -regardless of one's location within the room, there is unlimited opportunity to relax and enjoy the landscape as the sun rises and sets over the Napa River. Content: Degen & Degen is excited to be part of the design team for Sage Lodge, a new hotel and resort being built on over a mile of Yellowstone riverfront in the heart of Montana. 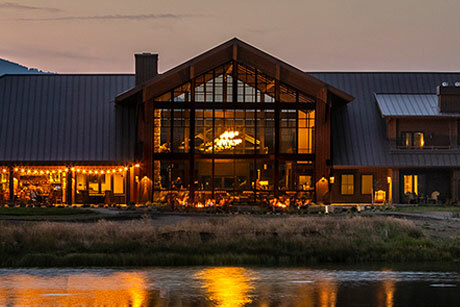 Looking out at the majestic Emigrant Peak and just 35 minutes from Yellowstone National Park, the Lodge will be a destination for fly fishermen, hikers and adventurers of all levels. 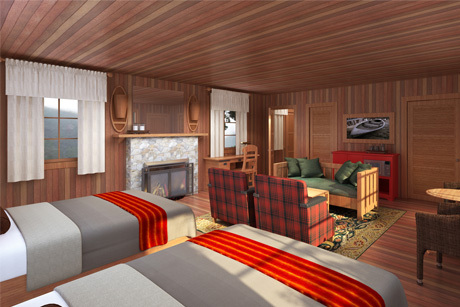 The rural resort is scheduled to open in summer of 2018 and will include 50 guestrooms, including a 34-room lodge and four stand-alone cabins. It also features a restaurant and bar, complete with a wood-fired grill and indoor and outdoor vantage points, plus a versatile event barn for private meetings or special occasion, and a full-service luxury spa. Content: Degen & Degen's team of architects and interior designers came together to renovate, re-develop, and re-brand this 8-building apartment community in Studio City, a neighborhood cradled in the city of Los Angeles. We created separate AVA and Avalon brand identities within this single property, each with its own leasing office and resident amenities, while capturing the trendy yet vintage glamour lifestyle that resonates within the LA community. 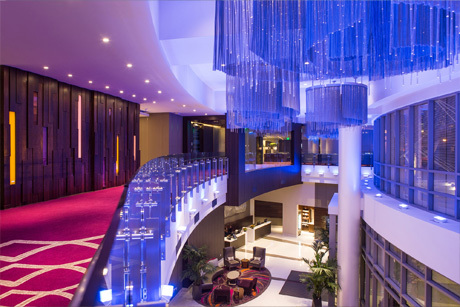 Content: The 23-story LEED Silver certified high-rise, 393 guestrooms total and amenities including lobby lounge with media pods, outdoor pool with party deck, bistro, state of the art fitness center and 7,000 SF of meeting & event space. This unique dual-brand hotel concept marries two distinct worlds, each with their own familiar Marriott brand standards all in one building and on shared levels. Grand Opening was celebrated July 2014. Content: New 17-story multi-family high-rise in San Francisco’s Mid-Market neighborhood, adjacent to Twitter HQ. 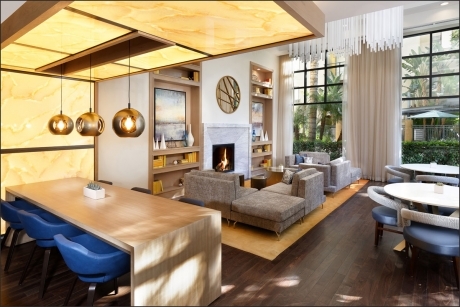 Hospitality design is the driving force behind gathering spaces where residents can socialize and interact en-masse. Fun design twists like the “Twitter Wall”, an interactive digital media hub of moving and ever-changing word clouds and the “Ridiculously Long Sofa”, which measures 30’ long, complete with cup-holders and USB ports for plugging in while tuning up or out, were developed to capture the minds and moment of the tech-savvy residents. Content: Three distinct hotels make up what we hail as an "Urban Resort." 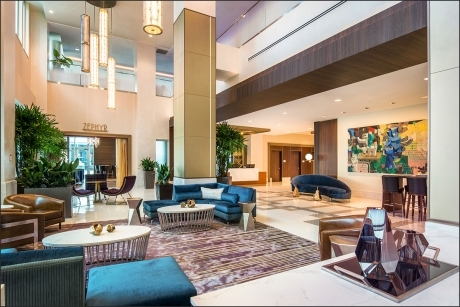 Located on a former Naval Training Center, these hotels will be distinctly San Diego, characterized by the unique military history of the site, it’s proximity to the Gaslamp Quarter, the Convention Center and the Bay. Master Site construction began early 2016. We anticipate hotel construction to begin early 2017. Content: This new construction complex of three fully custom hotels includes: a 7-story Boutique Hotel, a 6-story Conference Hotel & Center, and a 7-story Condo Hotel. Catering to guests of the nearby university, the complex totals 335-guestrooms for short and extended stay, 1800 square meters conference center, numerous dining options, recreation, spa & fitness centers, and retail. Situated on the shores of a newly constructed lake in the University District of Nanjing, this new hotel and conference center complex offers a retreat for guests, residents and community. 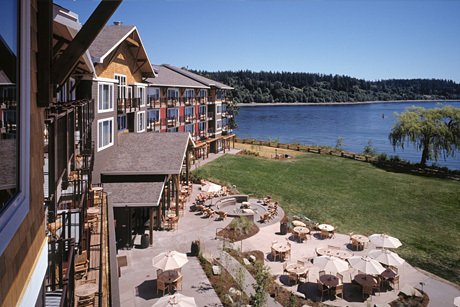 Content: From master plan through completion, D&D served as architect and interior designer for this waterfront resort for the Suquamish Tribe, ancestors of Chief Seattle. 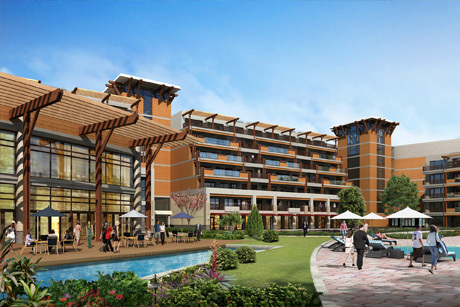 This 4-story, 85-room hotel includes suites, conference space, indoor/outdoor swimming pool, and a stand-alone day spa. Content: This ground-up 14-story hotel was custom-designed for San Diego’s historic Gaslamp Quarter. The district is one of the largest historical districts in the US with an eclectic array of architectural styles and a strong Victorian influence. The loft/warehouse atmosphere references the historic setting of this Residence Inn while integrating modern details with industrial materials. The public space offers a comfortable and progressive setting that feels residential and creates a strong sense of place. The guestroom décor is a lighthearted, eclectic take on Victorian Chic. 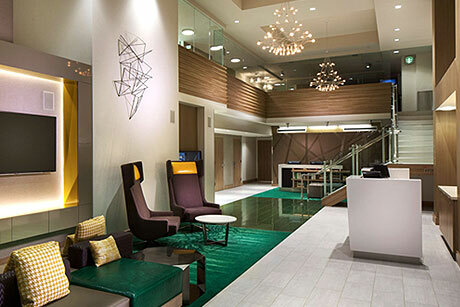 Content: D&D was the interior designer for a full custom public space and guestroom renovation for this 16-story, 375-room hotel in downtown Anchorage. 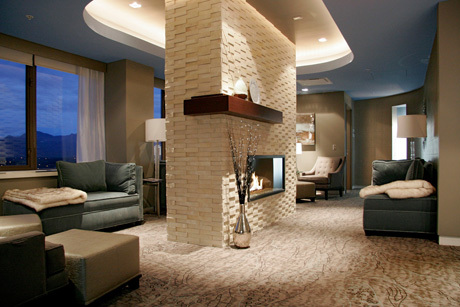 We also converted the entire 16th floor, formerly occupied by suites, to a luxury spa, ICE SPA. The new spa occupies space previously occupied by underutilized suites and boasts commanding views of nearby Portage Glacier and the Chugach Mountains. Content: 2019 renovation and refresh is underway. 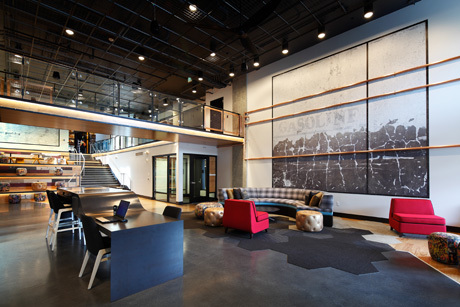 This project was an adaptive reuse of the historic Alaska Building a 15-story, high-rise in one of the oldest neighborhoods in Seattle, Pioneer Square. Building was reduced to shell and core – complete interior architectural renovation. 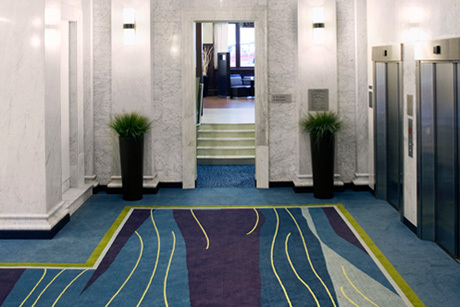 D&D was the interior designer and assisted with hotel architecture. 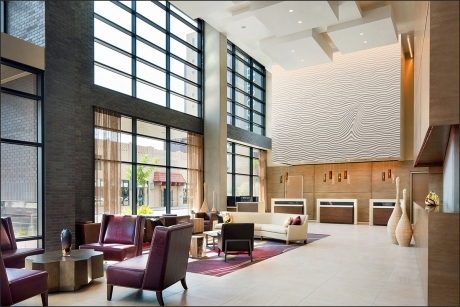 Its 262 guestrooms include 42 room types and over 4,600 SF of meeting space. Completed June 2010. Content: Downtown Phoenix, home to the growing Luhrs City Center, welcomes a new high-rise to its city skyline. The dual-branded Residence Inn & Courtyard by Marriott is the newest building to stand alongside the historic Luhrs Tower. Customized by the Interior Design team at Degen & Degen, this 19-story, 320-room hotel opened in May 2017. 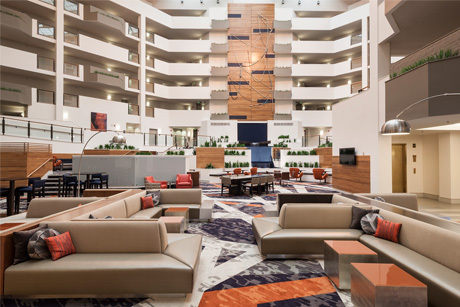 There are 200 Residence Inn and 120 Courtyard guestrooms, resulting in 20 different room types. 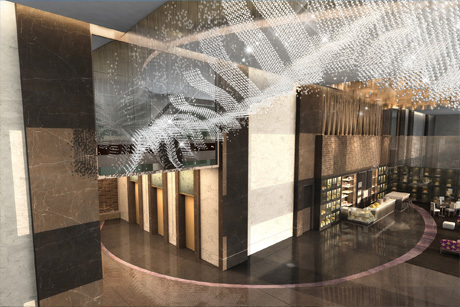 Various public spaces including 6,100 SF of meeting and ballroom spaces with modern amenities and a boutique aesthetic. Content: New construction of a 6-story 100-suite independent boutique hotel near the University of Washington, including underground parking, food and beverage facilities, conference space, and fitness center. Fluidity, transparency, and light are the central elements to both the architecture and interiors, inspired by Seattle's relationship with water. Throughout the hotel, metaphors of water remind the guests they are in Seattle. Abundant fenestration offers transparency to the building and natural light to every guest studio and bath. Content: Degen & Degen designed and planned several schemes for this large, multi-phased, mixed-use complex in the Chinese city of Nanchang. 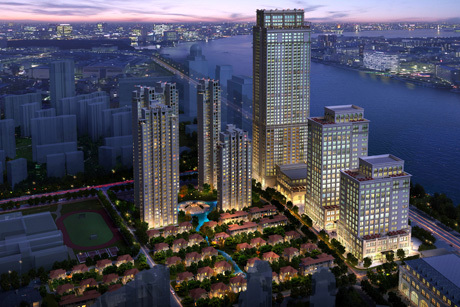 The site includes a hotel tower, office tower, condo & commercial tower, several residential components and a stand-alone shopping mall. 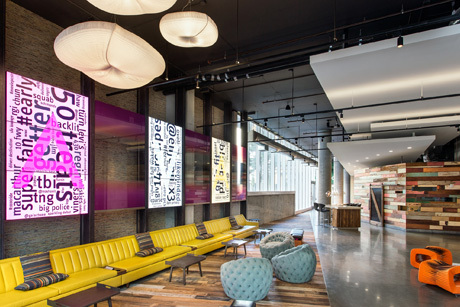 Content: The renovated public spaces and guest corridors of this 7-story hotel create a contemporary Northwest industrial vibe. It fuses comfort, technology, and the unique vernacular of Seattle’s Lake Union neighborhood through a hybrid of nautical-inspired millwork details; playful, tactile finishes; and strong graphic elements. 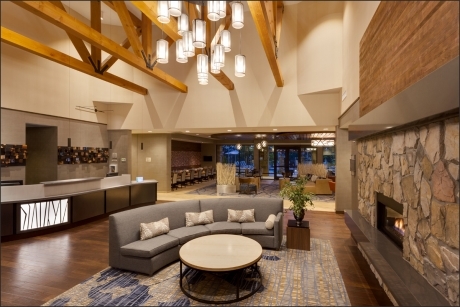 Content: The renovation of Lake Crescent Lodge enriched the guest experience by reflecting the historic status of the lodge and providing interpretive touch-points of local flavor and tribal culture. This renovation is respectful and sensitive to the environment in both a practical and aesthetic manner. Content: Dating back to the 1800’s, this Northwest rainforest lodge was rebuilt in 1924 and is still protected today as an historic site. D&D has worked with this lodge on several occasions, including a master plan of phased improvements. Our most recent involvement would be to start returning the Lodge back to its historic roots while enhancing the guest experience through high-end luxury details. 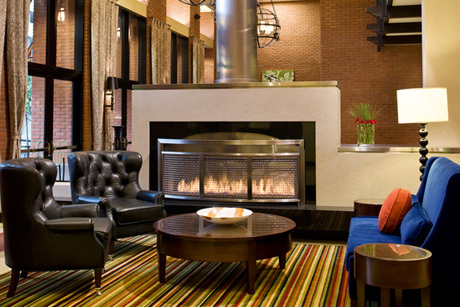 Lobby, banquet room, dining room and the lakeside guestrooms were included. 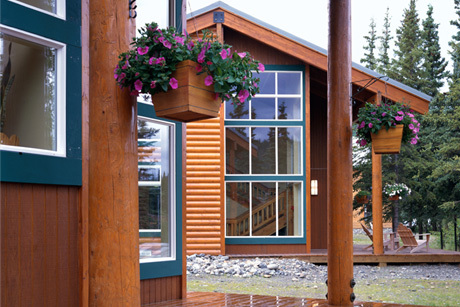 Content: Surrounded by stunning views of the Alaskan interior ranges, this resort, originally a modest collection of only 3 buildings was expanded to 150 rooms in 6 different guest buildings surrounding a renovated and expanded central lodge and restaurant. 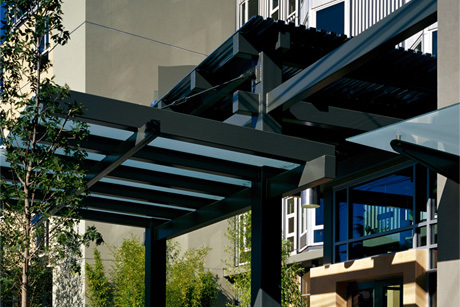 Our involvement included planning, architectural and interior design for the entire project. 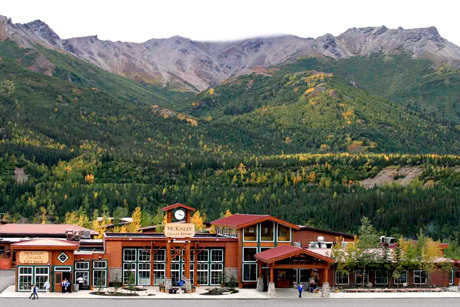 Content: Multi-phased, 35 acres of Alaskan riverfront make up this 350-guestroom resort comprised of nearly 100 individual buildings. Our involvement in the phased master plan started in 1996. Most recently, we completed a new main lodge. The new facility serves as the main arrival-departure building for as many as 700 guests daily. Included is a new 35 foot high atrium lobby and waterfall fountain, wild life and historical exhibits, restaurant, lounge, and gift shop. Content: 7-story, 250-Unit new construction multi-family high-rise in Seattle’s Capitol Hill neighborhood. The site was the Mercedes-Benz dealership; historic retail and garage facades were conserved and reused in the new building design. 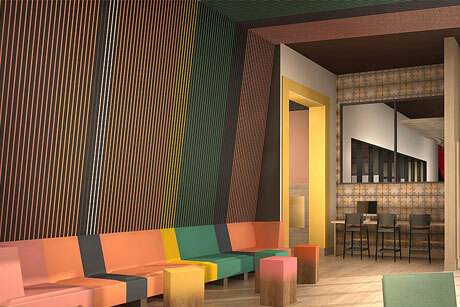 The interiors were to mirror the grit and semblance of the unique neighborhood fabric. 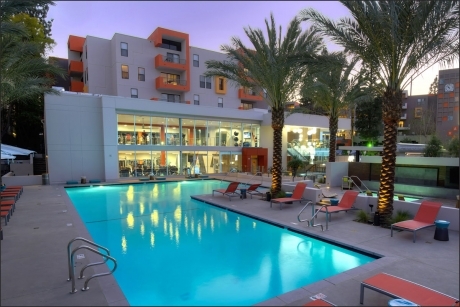 Content: This multi-family community is to be newly constructed in the Downtown LA Historic Paseo District, with 320-units and 50,000 SF of retail space. The Modern Mexican concept reflects the heritage of the historic site but interprets it in a modern way to appeal to an upscale, young professional renters market. 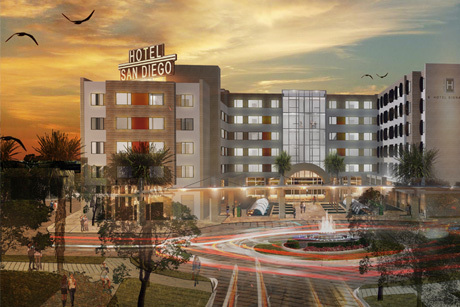 Content: New construction of a 14-story, 90-Key custom Courtyard Hotel in the historic Gaslamp Quarter in San Diego. The unusually small building footprint presented unique design challenges for the custom ultra-urban concept. A bold verdant green layered with an adapted steam-punk edge brings life to the property’s unique and quirky character, giving purchase within the vibrantly eclectic Gaslamp Quarter. Content: This 13-story, 438 apartment unit multi-family high-rise opened Spring 2017 in Washington, D.C. Strategically placed in DC's up-and-coming NoMa neighborhood, the interiors pay homage to historic industrial roots with an unexpected spin. Exposed steel garage doors, hanging mailboxes and a vintage boiler-fire place contribute to the industrial aesthetic aimed at an edgy Millennial market. 20,000 SF of indoor and outdoor amenity space also draw the demographic, notably teched-out communal workspaces and an indoor-outdoor roof deck with a swimming pool and views of the Capitol and the Washington Monument. Content: New custom full-service SpringHill Suites hotel in the rolling vineyards of the Paso Robles Wine Country in central California opened Summer 2015. The overall design concept is nature driven, highlighting the relaxed attitude of the surrounding area. Warm, reclaimed wood tones are accented by the colors of the landscape. The decor is casual, elegantly understated and refined.